SECOND LIFE, June 9, 2014 - The Alexandra Sautereau Collection [ASC] announces the launch of The Chameleon HUD for Chameleon Enabled Handbags at Fashion For Life [June 7 - June 20, 2014]. The Chameleon HUD is an enhancement which elevates ASC Chameleon enabled handbags to a new dimension. "I'm so excited to offer a new option to my handbag line. The Chameleon HUD is an enhancement for Chameleon enabled handbags which gives interactive functionality with colors you choose", said Alexandra Sautereau, designer and owner of The Alexandra Sautereau Collection. Chameleon enabled bags worn without the HUD attachment contain eight base colors activated by touch using a pop-up menu to change portions of the bag, when worn with the Chameleon HUD the color choices are infinite. 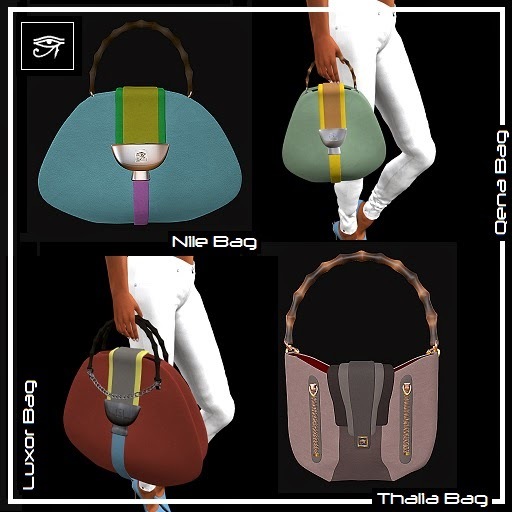 The first Chameleon HUD enabled items offered are the Luxor, Qena, Nile and Thalia handbag styles. During Fashion for Life the Chameleon enabled bags are on display at the designer's flagship mainstore on Mirandirge. After the close of Fashion for Life, the handbags will be available on the Second Life Marketplace, and select Alexandra Sautereau Collection boutiques in-world. Founded in 2010, the Alexandra Sautereau Collection brand was established as a collection of unique, original and on-trend fashion accessories.